July 14th marks our mission’s 29th anniversary. This month, we pray especially hard for the many generous contributors, and the hundreds of volunteers and staff members, who have kept this award-winning Catholic radio station strong over these many years. As we wrote in May, July 14, 2001, KNOM’s 30th birthday, will be greatly enhanced by the ordination of former volunteer Ross Tozzi to the priesthood, in Nome, and we will save the big celebration for next year. We hope you can join us! 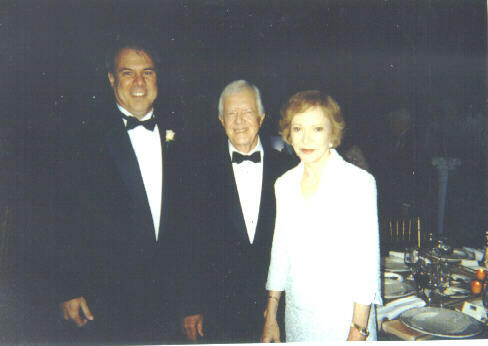 IN HIGH PLACES: (left) In June, KNOM program director Ric Schmidt had the opportunity to meet former President Jimmy Carter and his wife Roslyn, at a gala dinner in Washington, DC. The evening, which honored radio and television excellence, was organized by the National Association of Broadcasters. Ric represented KNOM at the event. Because KNOM was honored by their Crystal Award this year, NAB paid all of Ric’s travel expenses. And there was plenty of travel: A round-trip from Nome to Washington, DC involves about 25 hours in the air! MORE POWER TO US: Over 650 miles across Alaska from Nome, one of our “adjacent channel” stations (next to us on the AM dial) has agreed to allow us to test higher night-time power, as we continue to work toward this goal. Special thanks to our consulting engineer, Jack Mullaney, and Alaska broadcast pioneer Augie Hiebert, who are helping coordinate the effort. LOTS OF SPOTS: So far this year, KNOM has broadcast 19,800 Inspirational Spots, and an equal number of educational ones, thanks to you. INSPIRATIONAL SPOT: Lord, make me a point of contact, whereby the Holy Spirit may enter into those I touch, whether by the word I say, the prayer I pray or the life I live. In late spring, KNOM volunteer Kelly Brabec flew in a small plane to the isolated village of Wales. About 110 miles north of Nome, the town of 165 souls is located at the very westernmost point of the North American continent. Originally a whaling camp inhabited for over a thousand years, Wales adheres to a strong, proud Inupiat (in-OO-pee-at) Eskimo culture. …The bush plane…had six available seats and seven passengers. Guess who got to sit in the co-pilot’s seat…The scenery was fabulous and before I knew it, the pilot was preparing for the landing into Wales. With any type of travel, accommodations are needed. For a KNOM reporter, this usually consists of a wrestling mat and a schoolroom floor. I had both. I considered myself lucky. I found a cozy corner, set up my temporary “home,” and went out to explore the area. Tonight would be the opening night of the festival and I wanted to make sure I had a good seat. The Kinugmiut festival brought dancers from Anchorage, Diomede and Brevig Mission…57 years have passed since the last celebration of the Kinugmiut Dance Festival and tonight marks the festival’s rebirth. A breath of new life is going to be given to this dance tradition and I am honored to be part of it. I woke up early to feed KNOM the report I wrote about last night’s festivities. The singing and dancing continued past midnight and people started to head home around 1 AM. There was a strong rejuvenation in the air. Permanent expressions of pride and admiration were worn on the faces of everyone. The dancers, the singers, the villagers and most importantly, on the faces of the elders. Truly amazing. Once again I feel privileged to be here. A tobacco prevention seminar and traditional Eskimo games are scheduled for this afternoon. A blanket toss along with more singing and dancing will continue tonight. Just between us, I hope to get in on a piece of the blanket tossing action. My fingers are crossed. A young girl named Sonja approached me, took my hand and asked me to join the dancing. An elder named Ella encouraged me to do the same. I took Sonja’s hand and she led me to the floor. I told her that I didn’t know the “moves” that well and she would have to teach me as we went along. Her instructions were to watch and then imitate…When the song was finished I made my way off the floor. I was greeted by Ella with a handshake and a “good job.” Oh, yeah, I got to do the blanket toss, too! Success!! Later tonight there will be a potlatch (it’s like a potluck) and more singing and dancing. I had my last early news feed today. I have already packed my things for my departure later this evening. The potlatch started at 5PM and the families poured into the guy. Soon enough all the tables were occupied with the young and the old…I noticed that the fry bread was a popular item, as well as the sweet cakes and pies…I danced my final dances last night and took a lot of pictures of other people with their cameras…In a couple of hours I will be back in Nome. It was a wonderful trip and I am a better person because of it. The generosity and openness of this community has been overwhelming. I was swept up by the strong spirited people here and invited to celebrate their culture and traditions with them. I have been blessed with this extraordinary experience. Until the next village trip, God bless! (Editor’s note: History buffs will note that while long a base for Eskimo whaling, the village of Wales received its English name from nearby Cape Prince of Wales, given by Captain James Cook in 1778. Please consider adding missions like KNOM to your will. KNOM dedicates all bequests to savings for emergencies and for long-term improvements. INSPIRATIONAL SPOT: Humans judge by the success of our efforts. God looks at our efforts. 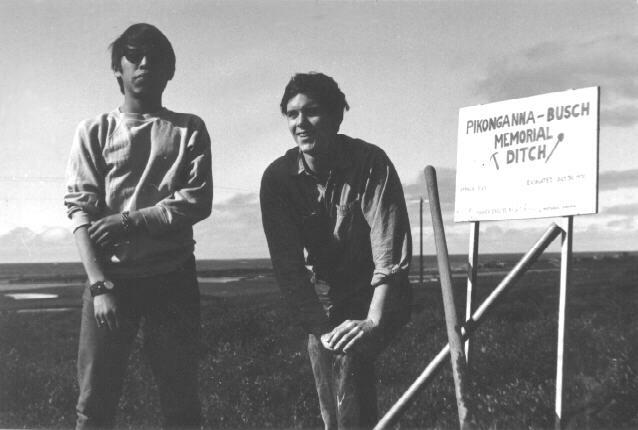 top THIRTY YEARS AGO: July, 1970: Mission organizers had received FCC permission to build the Nome radio station, but with the brief arctic construction season already half over, one barrier remained. The Bureau of Land Management was dragging their heels on the application for a right-of-way to use the transmitter site. With winter approaching, the volunteer crew had no idea what lay beneath the surface of the tundra. A tower foundation needed to be designed. Time was running out. (Left): While slow in coming, approval was inevitable, and volunteer Tom Busch teamed up with King Island Eskimo teen Dennis Pikonganna (pik-ah-WAH-nah) to dig a small pit on the site, in order to determine subsurface conditions. Five feet down, they discovered what everyone had feared: hard, permanently frozen silt and gravel, extremely unstable permafrost. Dennis and Tom posed for the photo after three days’ picking and digging, and local miners went to work designing a massive concrete base for the tower. PASSING THE BUCK: For the first time in three years, the cost of groceries in Nome had dropped to less than twice the cost of groceries in Portland, Oregon. Electric power in Nome is 283% Portland’s, gasoline is 143%, and propane is 246%. The quarterly survey checks a list of food items based on the USDA’s Low-Cost Food Plan. ONCE AGAIN, thank you most sincerely for your faithful help and your prayers. We are deeply grateful for your support and for your concern. It is you who keep our mission alive and strong. As thousands of our listeners migrate to even more remote fishing and hunting camps for the summer food gathering, please join us in prayer for the safety of everyone. One item you will always find in those camps is a radio, almost certainly tuned to KNOM, and we work our hardest to keep everyone inspired and informed. Thank you again, and until next time, God bless you!